I'm really enjoying making small but very detailed projects now! 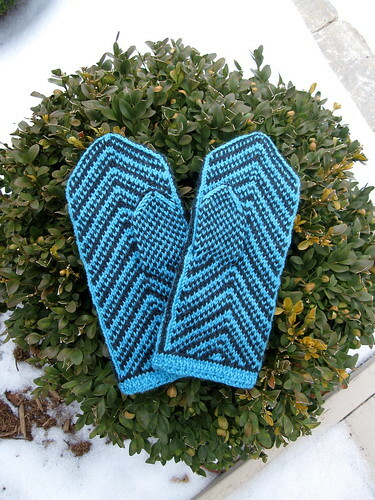 Here's another pair of mittens I've finished off. 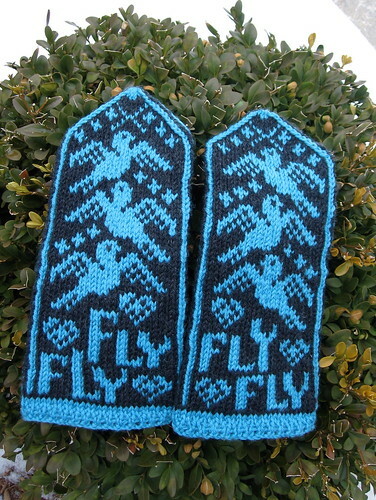 Modifications: The pattern calls for one heart on each mitt to be stitched over in a contrasting yarn plus a bird design to be stitched onto each palm (hence the 'bird in the hand' reference). I used red cotton to stitch over one heart and I decided I didn't like how it looked, so I decided not to clutter the look of the mittens and leave them as this simple two-tone pattern. Also, I changed the chevrons on the palms ever so slightly. What I like: I love the birds! This is a terrific pattern! 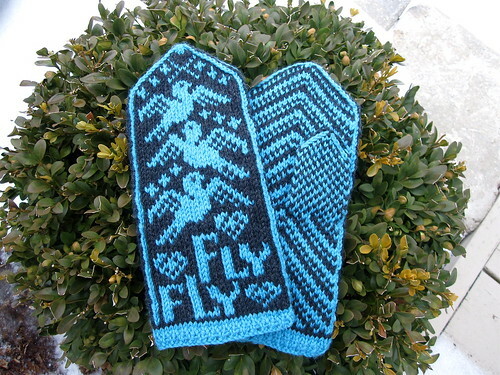 What I don't like: Maybe if I made these again, I'd do a thicker folded-under cuff and perhaps I'd change the 'Fly Fly Fly Fly' wording to 'Fly Fly Away!' or something a little less symmetric. Things to work on: I'm not perfectly consistent with the tension of the yarn as I swap between colours. Also, I kind of bungled the thumb joining. That's a skill I have not yet mastered. Destination of project: I made these just because I wanted to try out the pattern. The pale blue doesn't go with any of my coats or jackets and besides, I have enough mitts and gloves already. What do you think I should do with these mittens? Who should get them? Suggestions welcome! What's next: I started a jade green moss stitch cardigan. Let's see if I can make one adult-sized garment that isn't misshapen. 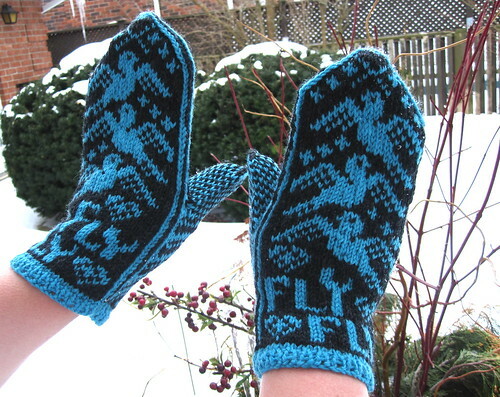 Those mittens are amazing!! Great job. Hi, I'm Andrea from Toronto. Est-ce que tu as peur? C'est l'Halloween! Do not steal my posts. Please contact me before reproducing any greentea.tk content elsewhere. Unless noted, all posted images + words are property of Andrea K. Williams. Do not reproduce without permission. Contact me at andreakw@gmail.com to use content elsewhere. Copyright Andrea K. Williams 2005-2014. Powered by Blogger.